I use aMule. But even with the SVN version from Arch Linux, it produces the same problem as I was using Linux Mint, high CPU usage problem. It works well at the beginning, but will suddenly high CPU usage, causes my laptop battery drain very fast. So, I try to find the solution. Then, I found one solution, not like using MLDonkey or other alternatives before. Using the aMule daemon, amuled from command line. Then you will be asked for entering password for mule connection. Enter anything you like. I think this is the bugs. So, to solve if, after entering password, wait a while before terminated, press Ctrl+C to exit. Then run amuled as above again. Okay, assuming amuled is running perfectly. 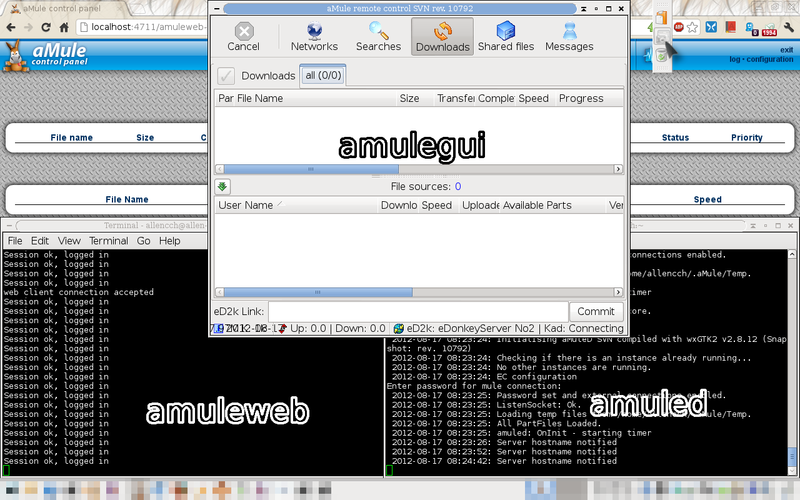 Now there are two options for the aMule client, one is amulegui, another is amuleweb. Just run the amulegui, you will be asked for the password as you entered above. The interface is almost same as normal amule. The only difference is even you exit the amulegui, the amuled is still running. AbovePassword is the password you used in amuled. WebPassword is the password that you are going to login in the web interface. Then, we can access aMule through the web browser with http://localhost:4711. The screenshot of runnign amuled, amulegui, amuleweb, and web browser. My HP laptop always has a shutdown problem. This problem affected the hibernation. That is, after I shutdown in Linux, my laptop battery will keep draining, and the battery is still warm after shutting down. To solve this problem untechnically, there are two ways. Never shutdown, but restart. Because I have dual boot, there is a grub menu when startup the computer. So, during the grub menu, press the power button, this will shutdown the computer without battery draining. However, sometimes the shutdown is accidentally selected. In this case, even boot into Windows and shutdown does not solve the problem. To solve this problem, when the laptop is shutdown, make sure the AC adapter is unplugged. Then, remove the battery and place it back. Then the battery will not drain. This problem can be significantly noticed with a USB cooler. Because if the cooler is plugged in, after shutting down the laptop, and if the AC adapter is also plugged off, then the cooler will still running. But once we plug in AC adapter (with electricity), the cooler will stopped. So, the only solution is remove the battery and place it back when the electricity is off. I still can tolerate with the problem with the first solution (power off in grub menu). However, I cannot tolerate with the problem in hibernation. This is because if hibernation, the battery is still draining, and there is no grub menu as restart. So, I found the best solution. If it is “enabled” and you have the same problem, try to turn it off.